During WW2 the U.S. Army had special photo units who’s task it was to cover the war in all theaters through out the world. Most of these soldiers held a photographic related profession in civilian life. Many photographers closed their studio’s (after Uncle Sam’s greetings) and joined the Armed Forces. And many motion picture cameramen too. It was a logical choice, even for the Army, to send these man to the Signal Corps branch. These citizen soldiers were teamed up to form specific photo units. 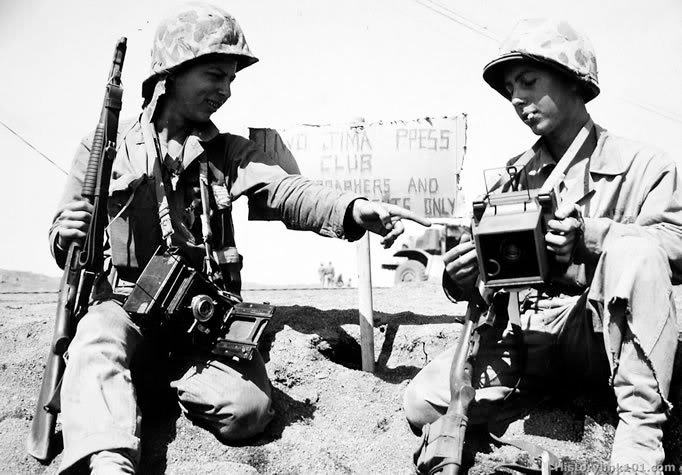 Their purpose: film and photograph the war. To document everything from generals shaking hands at a ceremony to the lowest GI being shot at. Even sometimes putting their own lives in danger to get an action documented. Most well known pictures are taken by Signal Corps photographers and released for publicity by the Signal Corps. 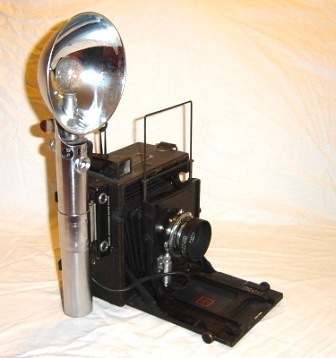 And the camera they used: the Graflex Speed Graphic Anniversary camera. Known to the Army as the PH-47. These camera’s had a film format of 4”x5”, so that, when enlarged, they would still contain enough detail and were useful to be used for poster and the like. Early in the war the camera was exactly the same as the civilian version. During the war chrome was considered a critical material and all the chrome parts on the camera were now finished with a dull black coating. The only thing that sets the army version apart from the civilian camera is a orange Signal Corps stamp. One on the bottom of the body (usually worn off), and one stamp was placed on the inside of the camera bed. 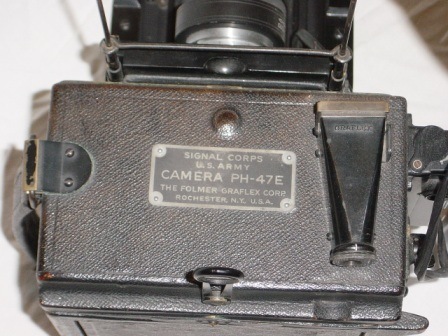 In late 1942 the Signal Corps decided that a nomenclature plate was needed to identify the camera. This plate was to be placed on the top side of the body, making it necessary to relocate the curtain aperture table to the right side. This relocation was also used for the commercial camera’s to ease the manufacture production. When the army ordered more camera’s, all they needed to do was to install a nomenclature plate! The Signal Corps had the PH-47A, B, C, D, E, F and G in use. These were all Folmer Graflex camera’s. The E and the F being the 4x5 inch camera’s that were standard issue during the war. The PH-47E had the 127mm f/4.7 anastigmat (Ektar or Velostigmat) lens, and the PH-47F was fitted with a 5½ inch f/4.5 anastigmat Paragon series S lens. But the camera didn’t come alone. With it was a whole set. A case with extra film holders, lighting equipment, lens filters, a tripod and lots more. The nomenclature for this complete set was: Camera Equipment PH-104. All extra equipment fitted in a fiber case so it could be hand carried in the field. 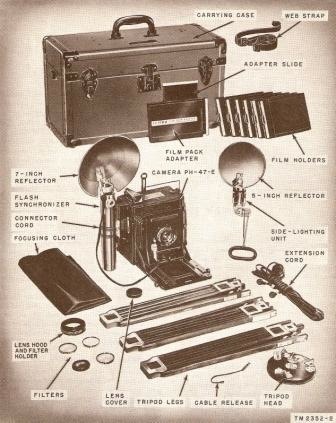 The case is the commercial style case made by the Folmer Graflex Corporation with some rearrangements for stowing the equipment the Army found necessary to use. This case was painted old army’s OD green and was fitted with a nomenclature plate of its own to indicate that this was the complete set: the PH-104. As with everything in the Army it came with a Technical Manual. The TM 11-2352. (For illustrations from this manual click here.) It covered the use and care of the camera as well how to destroy it in case of emergency. Unfortunately the Folmer Corporation demanded that after the war no camera’s were sold off as surplus equipment to the commercial market. The Army was obliged to destroy the surplus camera’s and bulldozered some 350,000 camera’s into scrap. The surviving ones that are around today are the ones that were sold by the Army to soldiers who wanted one. Probably most cameramen wanted to keep theirs. 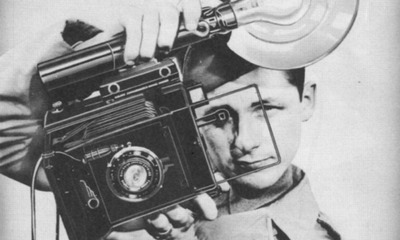 Note: In 1944 the U.S. Navy wanted a more rugged camera for use in the combat theaters and ordered in 1944 the Folmer Graflex Corporation to design a camera that could stand up to the rigors of combat. Nowadays known as the “Combat Graphic” by collecters. 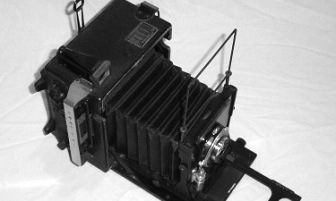 Folmer did designed a camera based on the Anniversary model but was enclosed in a protective body that did not expose the bellows or lens to damages from being dropped or slammed against a surface. This camera was produced in 1945, hence they called it the “Graflex 45”. It did see some limited use on Iwo Jima and during the Okinawa campaign. They came in gray (USN) and green (USMC). The U.S. Army did obtain some Combat Graphics, but were issued for trial after the hostilities ended in Europe. However, the Army never used green Speed Graphics during WW2. After the war most surplus Combat Graphics were bought by a commercial company, painted black and sold to the public. The ones the Navy kept, were issued up till the late 60’s.